This book contains Devil’s Gate and Hunter’s Season, the last two Tarot novellas in the Elder Races series, where the stories follow the path of a mysterious Tarot deck. 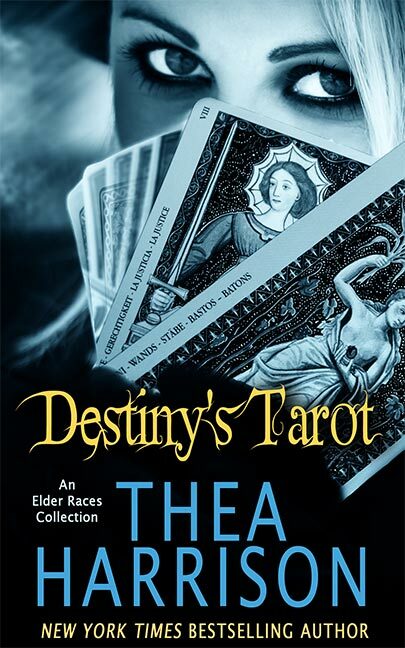 Destiny’s Tarot is available in both print and audio, whereas the novellas sold individually are only available in ebook format. Devil’s Gate: As a coroner, medusa Seremela Telemar has always felt more comfortable chatting over a dead body than over drinks. But when her wild niece, Vetta, runs off to Devil’s Gate, a lawless town that has sprung up overnight in a modern-day gold rush, she knows she has to extricate her before the rebellious girl gets into real trouble. Though she’s confident in her head snakes’ ability to defend her against attackers, Seremela is still a bit nervous about braving this modern-day Wild West by herself. Hunter’s Season: As a palace guard and assassin for the Dark Fae, Xanthe always wore a mask, hiding her emotions to do her duty. But when her identity is compromised, she trades undercover work for guarding Queen Niniane—a position that often brings her in contact with Chancellor Aubrey Riordan.